I picked up this book at BEA with huge anticipation, because I love Jennifer's first book The False Prince. I really, really love it. I've read it at least three times and have it in both a physical book and an e-book. So my expectations were super, super high for The Scourge. Did it live up to my expectations? Well... It's a good book and I enjoyed it. But I didn't love it. There's nothing I particularly disliked, but it wasn't as memorable to me as The False Prince. That doesn't mean this is a bad book - it's a really good book, but it didn't have that intangible "It" factor for me. I think this book skews a bit younger than the False Prince series. TFP was a young YA series. This is more of an old MG series. I think kids in that age range will love this book. Ani is a spunky young girl. She is part of a group of people looked down upon by the rest of society - an Untouchables caste, kind of. This has given her a healthy chip on her shoulder and a personality that always fights back and is always ready with a quippy comment. She's like a female version of Sage from The False Prince. She's a delightful character who doesn't give up and always sticks up for herself. Weevil is Ani's best friend and the relationship between them makes the book. He's a good trusty sidekick. He doesn't have the same hard edges as Ani, but he's there to support her if ever she falters. He basically makes her stronger. I particularly like the reversal of traditional gender hero roles here. Where it's the plucky boy who helps the hero girl. Della functions as Ani's frenemy. She's a rich, spoiled brat who looks down on Ani and is one of the main reasons Ani gets thrown into the "island." But as the book unfolds, her character becomes more complex. Both in that she changes to become more open-minded and because we get to know her better. While the "Mean girl" is a trope that I often tire of, this was done well and isn't overly simplistic. The plot is fairly simplistic. They get thrown onto an island with a bunch of sick people. They have to do slave labor. They can never leave the island. Ani rebels. They figure out the secret behind the plague. They rebel and upend the system. I'm not meaning this to be a spoiler. It's a predictable plot and we all know basically how it will end. That isn't a bad thing. The twists and turns of exactly what is going on with the Plague are creative and unexpected (at least initially). If I was a younger reader, I would have been very surprised. The book is well-plotted and flows well. It's a quick and enjoyable read. 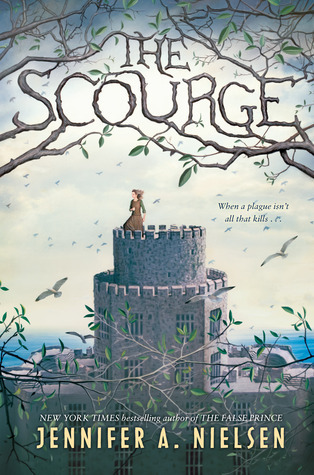 The Scourge is a book that late elementary school or middle school readers will love. Maybe some young high schoolers as well. It features a heroine full of attitude and sarcasm, characters that you quickly grow to like, and a story that will hold your attention. While I don't like it as much as The False Prince, it's another winning read from Jennifer Nielsen. Recommendation: Borrow if you're an adult. Buy for upper middle grade readers.